Horse radish is spicy to taste and has a strong flavor. It is added to sandwiches as well as in meat and fish preparations. It belongs to the mustard family and has lots of health benefits. It has been used by human beings from the ancient times for treating various diseases and ailments. 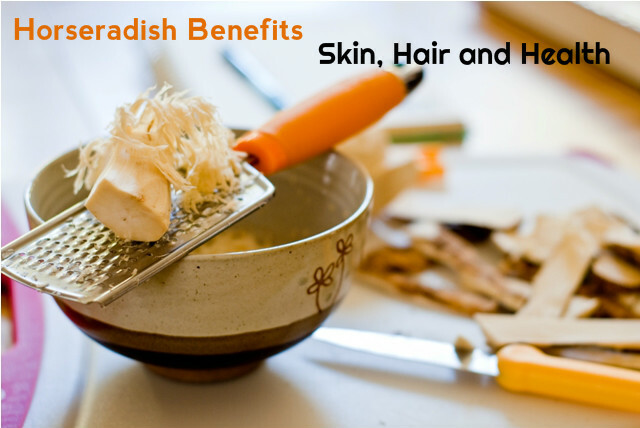 Horseradish is also beneficial for your hair and skin. When melanin is produced in excess or when the ceroid in the skin leads to the production of age spots, skin discoloration occurs. Horseradish helps in lightening the skin in a natural way. For this make a mixture of apple cedar vinegar and horseradish and keep it in a jar with a tight lid. Leave it for 2 weeks, but shake it every day. After 2 weeks, strain the mixture and put it in the refrigerator. Dip a cotton ball in it and apply on the skin to get a light and evenly toned skin. Horseradish is also good for treating freckles and has great healing power as well. Grate horseradish and mix it with buttermilk and glycerin. Let it stay overnight and then strain it. Apply this lotion regularly on your skin and you will see that it lightens blemishes, blackheads and acne. Horseradish helps in the increased circulation of blood in the scalp and this increases the growth of hair and prevents hair loss. You can prepare a poultice from this vegetable and rub on the scalp or use it in the form of lotion. You can treat dandruff by making a mixture of horseradish and vinegar. Make a mixture with 3 to 4 spoons of horseradish and half a glass of water. Gargle this mixture and you will get relief from various problems of the stomach. It helps in better digestion because of the presence of phytochemicals in it. Horseradish stimulates the salivary glands as well as the gastric and intestinal glands and thus promotes digestion and increases appetite. For indigestion you can grate horse radish and take its juice. If you take about 20 drops of this juice between meals, you will get relief from indigestion. However, if you have peptic ulcer, hypothyroidism and hyper acid gastritis, you must avoid taking this vegetable. The high content of Vitamin C in this vegetable plays the role of an antioxidant and helps in increasing the immunity of the body and in the treatment of viral infections. This is because of its ability to remove harmful free radicals form the body. Chewing horseradish is an excellent way to treat paradontosis. If you want relief from toothache and make your gums strong, chew the root of horseradish. It is also good for treating scurvy. You can mix it with grated carrots so that the strong spicy taste of horseradish is subdued. The potassium present in horseradish helps in controlling the blood pressure and also maintains normal heart rate. Glucosinolates present in the roots of horseradish has properties which help in lowering the risks of various types of cancer. It stimulates the liver to detoxify various tumor causing carcinogens and thus lowers the risk of cancer. In addition these compounds also help in preventing the growth of tumor that may be present already within the body. Glucosinolates have strong antioxidant properties. This help in getting rid of any infection in the body by increasing the flow of blood to the infected area and flushing out the waste products and toxins. They are good for protecting your body from colon and rectal cancers. The anti-cancer benefits are increased if you use processed horseradish. Horseradish helps in getting you relief from pain by increasing the flow of blood to the affected area. So, you can apply a paste of horseradish to get relief form pain caused by swollen joints and also for muscular pains. To get relief from arthritis, gout and chilblains, massage the affected part of the body with a paste made of horseradish. Sinus is caused when the mucus get accumulated in the sinuses. This provides a good environment for the harmful bacteria to grow and thus sinus is often painful. Horseradish contains volatile compounds which help in thinning the old mucus and thus prevents the accumulation of mucus. So, if you have sinus problems and upper respiratory tract infections, take half a teaspoon of horseradish sauce every day in the morning and afternoon. After having this sauce, you must not take any food or drink for 10 minutes. This sauce helps in clearing the mucus. Horseradish is also good for getting your relief from cold, influenza, congestions and so on. You get relief from chest congestion by applying a paste of horseradish on your chest. Consuming horseradish helps in increasing the production of urine because of its antiseptic and diuretic properties. It also has a chemical in it which provides antibiotic properties in the bladder. Some of the enzymes in this vegetable help in preventing the accumulation of toxins and thus flush out the bacteria and other inflammatory substances from the bladder fast. ‘Sinigrin’, a glycoside present in horseradish, helps in preventing the retention of water in the blood capillaries. This in turn is very beneficial for curing urinary tract infections and for the removal of kidney stones. If you press the raw leaves of horseradish on your forehead, you will get instant relief from headaches. The root is good for tonsillitis and the tea made by using its flowers is a good remedy for cold and flu. This vegetable is rich in iron, which helps in the cellular metabolism and also is essential for the production of RBC and the bone marrow. You can also soothe your nerves with this vegetable.